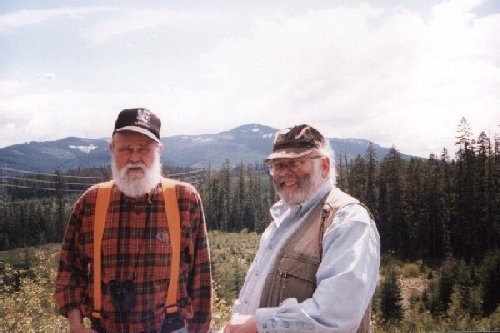 Bill Harper in suspenders, Cliff Olson w/always smile. Roads: 224 - 57 - 5730 - 5731 - 130 - 4661 4670 - 4672 4645- 4640. Long drive day. Walks. Trapper Steve, Cliff Olson and me. Trapper's pick-up. Full sized king-cab. Back jump seat proved hard to take on a long day. I rode back there so Cliff could keep his knee straightened out. Clear, about 80 all day. Got hotter at times in truck because the black paint pulled in the heat. Also, not a lot of ventilation in the back, little flip-out window. Steve has a thermometer built in to his electronics that gets the outside temp. and lists it on a display in the overhead. Somewhat hastily arranged. Trapper Steve wanted to go today because only opportunity really for the next two weeks. Rod Cusic and Woody had bowed out with regrets. Cliff OK on short notice (late Sunday). 1. Summer foliage changed things. 2. Found old rock excavations and mounds on Devil's Ridge. 3. Got the lay of the land up there. 4. Tumble Creek and Lowe Creek potential. 5. Oak Grove Butte habitat. 6. Trapper Steve probably proved right on Thomas using different site or his story was turned around in Green's book. This really only matters if there is another, more important Thomas site further to the south of Burnt Granite. Summer foliage was out heavy. Not much depth of view looking into the forest and canyons. Extremely easy for anything to hide, just by standing in the shadows. We started to think we have to go to audio recording mode and try to get a response. The next opportunity is well placed camera set-ups. How do the Big Hairy Beasts find each other in summer? Do they want to find each other in summer? Would ESP work for them? About ESP and us. Ever feel something watching you? Cliff said he first really remembered that happening one day hiking. He stopped and looked all around and then up on a rim above him, he saw a Great Dane dog looking intently down at him. The dog was with a hiker that later moved into view. Earlier, up the Collawash River, both Steve and I had experienced that near Steve site 1. I really got a dose of it the day I was up there alone. Went to the end of 5731. Steve was impressed by Devil's Ridge. Cliff and I went down hill a little ways and Steve went a few yards into the woods to do a test set up of his marten trap arrangement. He wants to spend a few days marten trapping late in the fall and winter. About 100 yards down the hill, through the trees, I saw a talas slope not too accessible off to the east. Lots of down timber right next to the clear cut line from the winds and snow, so not a good way to get to the bare rock slope. Went back up the hill through the clear cut. It wasn't growing back very well with the northwest exposure. Moderately steep with easy walking. Trapper Steve was already done with his test set-up. Neat set-up. 1 ½ "conniebear "humane" snapper behind some cut branches. There was a drop line and a feather for a lure. Natural looking. He said he would use powerful trapping scents with the real thing. He showed us how it worked. The trap snaps hard on the animal, breaking its back or throat. Under the strain of the trap spring releasing, it jumps off the tree and hangs out in mid-air, protecting the carcass from other animal's mutilation. He handled it all with experienced confidence. Looked trick to me. Took only a few minutes to take it apart. Cliff's knee was bad today, so he stayed next to the rig while Steve and I made our way out to the ridge and northeast through the trees to the rock area. The forest was virgin along the ridge and for a ways down the slope on the side opposite the clear cut. The talas slope was essentially the NE end of Devil's Ridge. Now the trees were pretty good sized, but may years ago, there could have been a good view down into Oak Grove Fork of the Clackamas River and to the ridges beyond. Scree was bigger than it looked. I went along the west side and Steve along the east. My side was a jumble with lots of burrowing animal holes. Moss, lichens, bare rocks and a few scraggly bushes were in the rock area itself. Elevation was about 3,800'. Steve called for me to come over to his side. He had found 3 holes that weren't natural in the rocks. One was a cone about 18" deep and 6' plus wide with a little bench on one side of it. It was on almost level ground. There was no sign of logging or modern human work in the area. Steve had found another on steeper ground and it too was a cone, a little smaller, about 4' across and 1' deep. Brush was growing out of one side of it. I found another smaller hole and Steve found two other shallow ones he had found. I wandered off, until I was looking over the cliff side from where I was standing. It was almost sheer and a good 150' drop to the rocks below. I turned and went back along the slope to where I could hear Steve. He was looking at a rock pile when I came over a little knoll and out of the last little band of trees on the ridge. It was just on the other side of the rocks I had been looking at when Steve called me earlier. It was an old pile, jumbled and moss covered about 8' long, 4' wide and 2' high. It was made out of medium sized stones. They would have been an effort for one man to lift. About 30' away, there was another very similar pile. They definitely were not natural. They had plenty of rodent holes in them. Next we went back up the ridge to the good view point where Cliff, Bill and I had stopped. I asked them to humor me, so they did. I set up the 4" spotting scope and showed Cliff what the various types of eyepieces did to the view and magnification. We could see Timberline Lodge through one powerful set up and Cliff was impressed. He played around with them and got us a good view of the fire lookout tower on Si-Si Butte (sigh, sigh). We compared binoculars, he had gotten a really good set at a garage sale. They were from Japan and were clearly made shortly after WWII. He had gotten some very good glass, cheap. When I'm alone, I don't do too badly handling my accessories. With Cliff or anyone, I get the need for a good optical accessory case cause I try and speed things up too much. Trapper Steve was bored with all of that stuff, so he wandered up into the regrowth looking for tracks and other interesting things. After all, we were on Devil's Ridge; but, he too remarked that it wasn't much of a devilish place. In fact, he said it was kind of nice. Before we went on our way, we had a good lunch. I had tuna sandwiches again. We all had celery, sausage and white cheddar cheese, Cliff's famous boiled eggs with salt and pepper, water and coffee. Anyway, the spur road to get down the hill is hidden by the rock quarry, it runs right beside it. Steve was driving and it was all I could do to calmly explain to the two up front that we needed to turn into the quarry to start down the hill. We tried a couple of short roads first, just to make sure though. I would say "turn here, turn here;" but my macho companions up front had no need of maps to find their way though that part of the forest. Went south on 46 and turned up 4670 to the west. Went up about 5 miles and snow shut us down about 1/2 mile higher than the 4672 turn off to the south along Rhododendron Ridge. There was still thick snow up on Granite Peaks. Cliff pointed out a big cornice at least 8' tall that was about ready to drop. That would be a sight, as it was quite long. We turned and went south on 4672 road. It is about ½ way up the ridge and runs roughly north-south. Got about 3-4 miles or about a mile past Tumble Creek to where snow blocked the road. Went for a ½ mile walk to solid snow. Very bright. Hard on the eyes. Looking at the lay of the land, I think Steve is right about the error of directions in the Thomas story in Green's book. We still hadn't gotten to Jim's Meadow from where it was located on the map. To us, this put a new importance on both Tumble Creek and Lowe Creek. Anyway, Steve had his GPS along. We had a little contest. Cliff just guessed from experience that the snow blocks were at 3,800' Steve's GPS showed us just about at 3,800'! It was about 80 degrees on the thermometer all day. It felt hot in the mountains and the snow was really soft and melting. It was clear why winter conditioned animals would move up with the snow during weather like this. We took some of the soft snow and ate it. It was cooling and very good. They dropped me at the road that parallels Tumble Creek down the hill. I was to meet them on that road. They were going to scout out middle Lowe Creek. I felt slow today. Took a side road and made the creek. Old growth buffer was left on its north side, but logging had gone literally to the creek bank on the south side. Huge rhododendron fields were left in the clear cuts on that ridge. Few if any trees were regrowing in the cuts. The fields were still weeks from blooming, but they would be a sight at just the right time and from the right place. We are talking thousands of acres of rhododendrons. I heard blasting three times to the south at about our level. Thought there must be quarry down there. Banged on trees a few times with a club. No answer. To the north, I heard two shots. It was cool and shady under the big trees. Good spot for an I-R operated camera I thought. Found a 14" log that was perfectly hollow laying up beside the road. Nesting materials in it. Scared to stick my face in the hole. Didn't want some weasel mother clawing my face off. I headed downhill along the creek, east bound. Not much animal sign. After a while, I cut back to the main side road and pretty soon, Steve and Cliff came driving down to pick me up. Came back on 46 past Austin Hot Springs. The jump seat was getting cramped. Also felt the bounces good and there wasn't too good of ventilation. Warm. Didn't get car sick, but not feeling tops. I wanted Cliff to have room for his knee, so kept telling him it was ok back there. Cliff had often talked about the Tag Creek and Tar Creek roads that go up the west side of Oak Grove Butte. He had spent a lot of time up them when he lived at Three Lynx. It was about 5 PM when we got to Tar Creek road and decided to have a look. There was very heavy growth, probably as a result of the west side weather. Growth was so heavy, it finally turned us around because it was taking over the road. We were on 4645 road. In the shade and on the spring moist banks, there were the most beautiful little lilies growing. We then went up Tag Creek road. Some hog had dumped a box of newspapers and they were all over. Damn people like that. Road was 4640. Spur 150 to take us higher was blocked. Cliff said that there was a pond up that road loaded with trout. He said they were hungry critters with excellent hatch sites, but not enough to eat. Said their heads were way out sized compared to their bodies. Called them "Bigheads." We were tired and turned around. At the bottom, I asked Cliff if I could sit in front. Those two roads had been just a little too much for my stability system. I needed some air real bad. We went home. Oak Grove Butte is where Cliff saw the track about 25 years ago during deer season. He was up near the top on the east side near where the microwave reflector is now. Said there was a small pond and spring up there for water, as there isn't much water on the Butte.